Since Christopher McDougall popularized the practice in his 2009 book Born to Run, more and more runners have been opting for minimalist shoes or, ditching the foam altogether, barefoot running. Followers of the barefoot movement maintain the practice both significantly reduces risk for injury and improves running performance. But is there real, scientific proof to back these claims? According to Dr. Irene Davis, the answer is a resounding yes. Irene is one of sport’s leading experts on running biomechanics and injury as well as the most credible minimalist shoe and barefoot running advocate in the world. A professor in the Department of Physical Medicine and Rehabilitation at Harvard Medical School, Irene’s research revolves primarily around the relationship between lower extremity mechanics and injury. She’s devoted the last decade to developing protocols to alter runners’ gait patterns and thereby reduce those mechanics known to cause injury – mechanics, as Irene has learned, often caused by footwear. 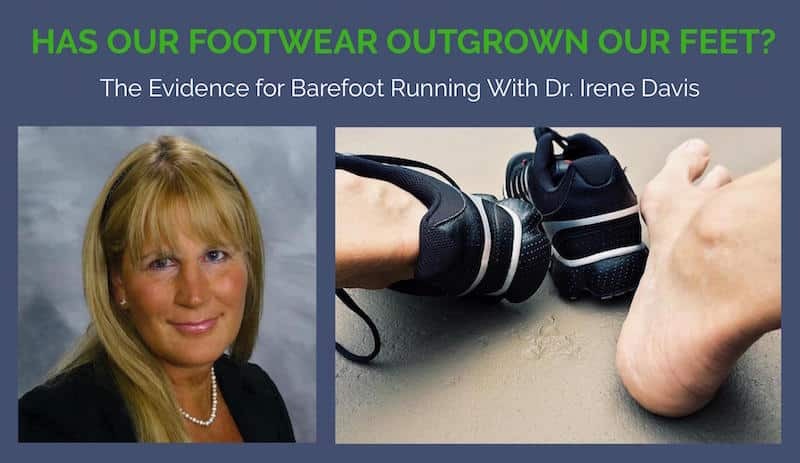 Listen in as Irene explains how the evolution of footwear has ultimately come to defy our own and how barefoot running and minimalist shoes could just get you to faster times and fewer injuries. 4:30 What research are you involved in? 4:54 How did you get involved in biomechanics research? 5:36 Were you initially working with the general public or professional athletes? 6:22 Given your prior background, when and why did you become a barefoot running advocate? 9:12 Why do you think so many runners get injured every year? 10:44 Why do you believe supportive footwear is causing injuries? 14:03 Are these shoes encouraging heel-striking? 16:29 Is it correct to assume that strengthening your intrinsic and extrinsic muscles will correct issues? 18:46 Why do shod runners with a forefoot strike have the best loading-rates? 21:04 How should someone go about altering their stride? 26:35 How could a runner perform weight-bearing exercises while doming? 30:38 Can an injured runner do these exercises? 31:27 Are there significant differences in alignment between runners in shoes and barefoot runners? 32:35 How is dynamic stability affected by footwear from barefoot to minimal to standard running shoe? 38:48 What brands of minimalist shoes would you recommend? 43:07 Where do you see the future of barefoot running going? 45:06 As a barefoot runner, can you run on any surface or are some more preferred? 49:41 How can a traditional runner transition to barefoot running? Thanks Dr for this guidance. May I know is there any other things which should be taken into care for Runner? Like my friend is using many running products ,do those products really helpful to free from injuries ? your feedback should be appreciated.